Start by heating an 8-inch cast iron skillet over medium heat on the stovetop. Cut off a quarter-pound piece of dough and shape into a ball. I used our master recipe, but if you swap out a quarter-cup (or a third-cup) of the water for olive oil, you’ll have an olive-oil pizza dough. 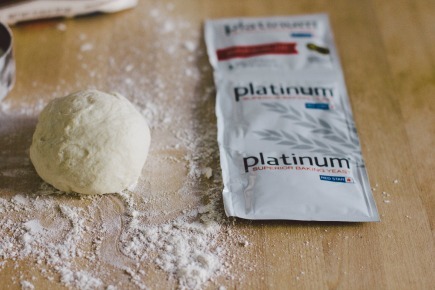 We test our recipes with all-purpose flour, and for yeast we’ve been using the new Platinum product from Red Star with great results. Flatten the dough with your hands or a rolling pin, and roll into a 1/8 inch thick round. 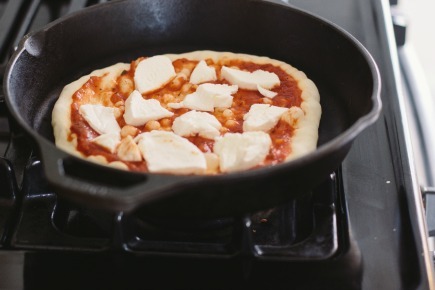 Carefully transfer the dough to the preheat pan, and quickly spread the tomato sauce over the dough, then the cheese and whatever other toppings you are using. Cover the skillet and cook for about 4 minutes without lifting the lid (unless, of course, you smell scorching). When your bottom crust is browned to your liking, remove the lid, turn on the broiler, and toast the pizza for 1-2 minutes to get a crisp top crust. Remove the skillet from the oven, then take the pizza out of the pan with a spatula. Allow the pizza to cool slightly on a wire cooling rack. Cut into wedges and serve. Top the pizza with 2-3 thinly sliced button mushrooms, 2 thinly sliced garlic cloves, mozzarella cheese, and a sprinkling of fresh thyme. Note: Red Star Yeast (Lesaffre Corp) is a sponsor of BreadIn5, LLC and its promotional activities, and supplied yeast for recipe testing. This look Grrrrrreat. I lived in Sicily and Italy for 5 years while serving in the Navy and Marine Corps, and I came to love pizza al forno di legno (wood fired oven). The best ever. I would time how long the pizzas would be in the oven to cook. Usually about ! :35 minutes. Never more than 1:42. The pizze were never drowned in tomato sauce (home made) and never choked with too many topings. And you don’t eat pizza by cutting it into wedges and eating it by hand. Bad form. What you do is use your knife and fork and cut pieces to take to your mouth by fork. Oh, yes! And drizzle some olive oil over the pizza, no matter how you cook it. Reminds me of the pizzas we had in Naples, now I wish I’d made it down to Sicily! Sicilia is all too often off the beaten path. Perhaps, that is why it has managed to retain so much of its grand history and culture… although by their own admission, it is slipping away. When I was in Sicily the first time, 1963-1965, Sicily was still recovering from World War II and still had its absolutely beautiful rural and religious charm. There were still lots of war widows who were still wearing the traditional black. Having one thousand lira, one dollar and sixty cents, in your pocket could get you a wood fired pizza with a half-liter of vino locale, plus wonderful conversations with the workers and diners there. My favorite pizzaria in Catania, Sicily, was “Ciclope – Cyclops”. It had a lava, brick, and stucco wood fired oven shaped like a cyclops’ head. The open mouth was the oven, with the fire to the back side inside. The eye was open, perhaps, to draw air. The pizza maker would pinch off some dough, use a large dowel as a rolling pin, then slip it up in a air a few times. Then just a little home-made tomato sauce, the topings, not too many, then repeated pinches of mozzarella from a large ball, about the size of a base ball. Then the oil. Then just a few moments in the oven. It all sounds fantastic, I will make it my first stop next time I go to Italy! I made pizza with you Naan bread, and it’s wonderful! Gorgeous pizza, I love the toppers! Sarah’s pizza does look good. But I was curious, who is Sarah? Have I missed something? Will she be taking over for you and Jeff while you’re busy churning out more cookbooks? Phil, God bless ya, and you can eat pizza with a knife and fork if you want to, especially if you’re still living in Italy, but–seriously?–that’s not the way it’s done here, unless you want to be mocked like New York Mayor de Blasio. Bon Gustaio, yourself! Thanks for the inspiration! I spent the better part of last winter perfecting things like chocolate cake, cornbread and coffee cake in a cast iron skillet on the stove top to make while camping. Looks like pizza will be added to the menu!! Um. Not to nitpick, but I saw the picture of a beautifully browned pizza and the phrase “without turning on the oven” so I got curious and excited. 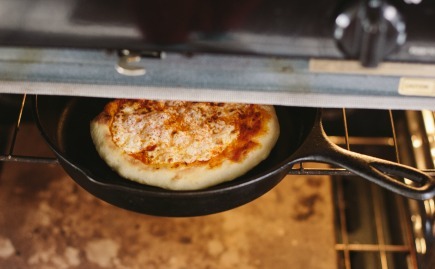 Some pizza stones take up to an hour to preheat, so flashing it under the broiler is still a time and energy savings. But, you’re correct, it does require a couple of minutes to melt the cheese. A kitchen torch would work! I use it all the time to add color to roasted veggies and casseroles and the like. May be my favorite kitchen tool, great idea! Has anyone tried pre-heating the skillet with the lid ON? I was wondering if the retained heat would color the top of the pizza while it was baking on top of the stove. Lining the inside of the lid with heavy-duty foil might be even better. Using the lid will certainly retain some heat, but it may not be quite enough to melt the cheese without buring the bottom crust. I certainly would give it a try, but watch that bottom crust closely. I’ve used this method to whip up some quick bread for dinner using the basic recipe. It’s fantastic. Since I’m not using toppings, I just flip the bread after the four minutes to toast the other side. The only addition is a touch of olive oil and a sprinkle of fleur de sel. 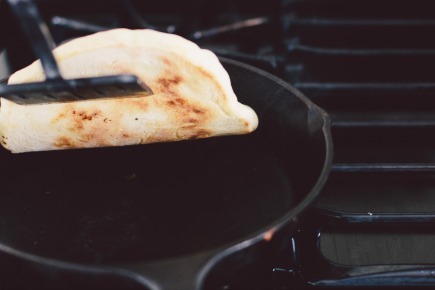 If you haven’t tried the stovetop naan from the book, you should, it is tasty! We use ghee, but olive oil is great too! This is now my NEW favorite way to make pizza! So quick and easy to do. 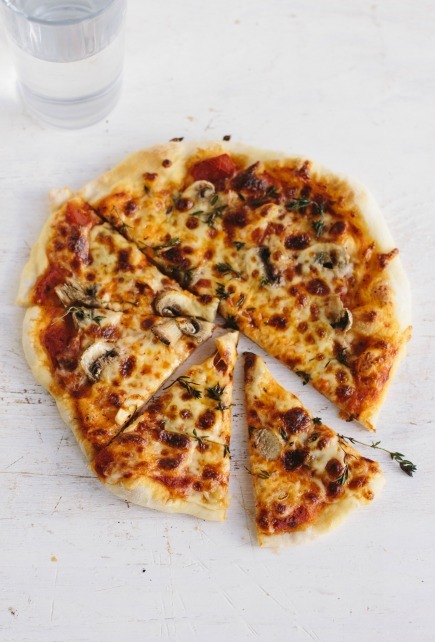 It was unanimous – everyone liked them better than pizzas from the oven! This is terrific, so glad you liked them! My skillet doesn’t have a lid. Would foil over the top work, with a lid from another pot on top of the foil, work? You can use the same size dough or add a bit more to get a slightly bigger pizza, maybe two more ounces. Foil will work well. Hi, I’m working from “The new artisan bread” master recipe but I’m Dutch and can’t get the exact ingredients mentioned. All of the flowers I have available have a much higher protein content. The lowest being at 12% and most averaging 14-16% (whole wheat being easiest to find, and most interesting to me). The breads taste fine but are very dense and chewy. I’ve also noticed my dough rises very little, both during mixing and baking. I’ve experimented with water volume, water temperature and different kinds of yeast but found no improvements. Adding water very quickly turns the dough so slack that the breads turn into bread pancakes before going into the oven. Any suggestions? I’d like to keep using the available 14% protein whole wheat flower but it would be nice if I could get my breads a little lighter. If my oatmeal bread dough is more than 10 days old (we were out of town) can I still make the last loaf, or should I throw it out? It still looks ok. If the dough does not have dairy or eggs, then it will be fine to use. If the dough does have those ingredients it is best to toss it and start again. That looks so delicious, have pinned it and I can’t wait to give the recipe a try! Would it be possible to put a rectangular pizza stone over two burners, or do you think it wouldn’t get hot enough? I could cover wuth a cookie sheet. I am concerned that the pizza stone would crack. I would actually be afraid the stone would get too hot and it may crack. 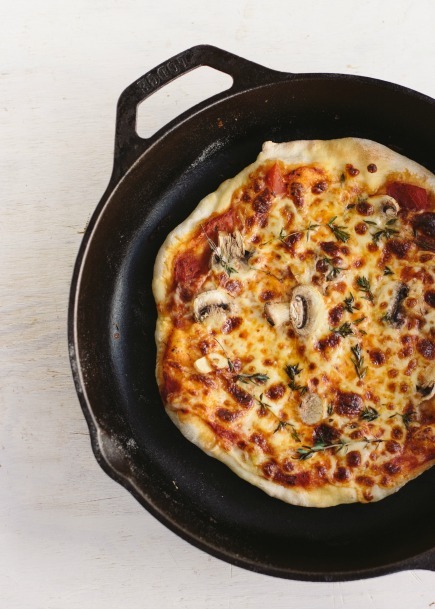 If you had a flat cast iron pizza pan, that could deal with the heat. I do have a cast iron Emile Henry stone that can go in the barbecue. I think I will try it. In the meantime, we tried the regular method using pans today and it came out great. We just wanted more than we could make in two pans at once. The stone should be preheated to the highest temperature your oven will go, which is 500 to 550°F. No rising is required. I absolutely love this method, thanks for sharing it! For those who want to do several at once, i recommend using two pans. Get the first one in the broiler, and them start the second one. 2 pizzas in less than twenty minutes can’t be beat. Hi, not sure if this question has been asked but I read the FAQs and couldn’t find an answer for it – I just made pizza dough from your “Healthy Bread” book and I used the spelt flour recipe. Is it possible to freeze the pizza dough AFTER you roll it out (freezing it on a sheet pan and then wrapping it in tin foil? If so, would you just take it out of the freezer, let it thaw on the counter, then bake it on the stone? Would this work or is it better to freeze the ball of dough and do it the regular way? Yes, it’s possible, and both methods work (the rolled-out freeze is quicker on the back-end). The procedure for it in detail is in our third book, the pizza one, on Amazon at http://www.amazon.com/gp/product/0312649940/ref=as_li_tf_tl?ie=UTF8&tag=arbrinfimiada-20&linkCode=as2&camp=217145&creative=399349&creativeASIN=0312649940 . We’ve never published that here on the website. Thanks Jeff, I’ll have to get the Pizza book. Made my first pizza tonite with spelt flour and it turned out well except I thought it puffed up too much in the oven. I rolled it out to 1/8 inch and baked it on the pre-heated stone, 450 degrees, baked it for about 25 minutes. The crust came out over 1/4 inch high when it was done. Is there a way to get a thinner crust; should I roll it out even thinner? I used rapid rise yeast if that makes any difference and the dough rose high when I let it rest for the 2 hours then I refrigerated it. Thanks for any advice you can give me for a thin, very crispy crust. All you can do is make it even thinner. The yeast chosen won’t have any effect.